You have been Hired! 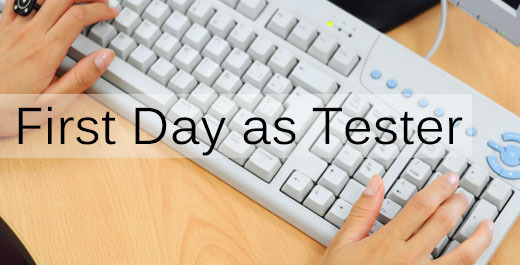 You have got your dream job as a Software Tester! Congratulations! Now you wonder what the first day/week at work would be? What can you expect? You walk in the first day, someone will meet you (Test Lead/Test Manager), you will be assigned a seat and a PC. Usually someone will be assigned to mentor you (a Buddy mentor). This person will walk you through the application/product, the processes, introduce you to the rest of the team and basically give you a tour. You will be shown the ropes, in a leisurely manner. Sometimes you may be thrown into the deep end of the pool, given some or no documentation and asked to start testing right away. In either cases, understanding a few things comes in handy. This article focuses on that. All applications in this world – are about Data. Applications collect data, store it, modify it, re-present or present it. It is data, data, data. 1. Validations are done before the data is stored for consistency (eg. Gender: Female, Male instead of F, M) etc. 2. This stored data is manipulated/modified when some pre determined condition is met. How the data is manipulated is based on business rules or business intelligence. 4. Again based on some business conditions, there may be alerts or advanced warnings of what to do. 5. The data may become redundant. eg. Customer moves onto a competitor. 6. Access and Authentication: If a person can see the data and how much can he see. An understanding of this makes understanding any application easy. Identifying the databases and what data is going in & how this data is used, Business rules, presentation ore re-presentation of data will help simplify understanding of the job. Getting access to the appliction(role, permission) will help you play around and understand the application. In some organizations, there may be clear, streamlined processes and visible ones. In others, the processes may be present but not easily visible. And in some there might be none whatsoever. Remember sometimes Developers are allergic to the word ‘Process’ but you may be pleasantly surprised to see how streamlined the development activity is, even though they don’t use the word process. And vice-versa. If there are no processes whatsoever, implement a few. A process is something that reduces or removes re-work. Team Meetings, Team Documents, Emails, One to One, networking with others at Lunch, Coffee will give you access to information. It is best not to make assumptions about priorities. Straight forward communication, keeping the relevant members of the team informed helps prevent nasty surprises for everyone. And enhances your reputation as a professional. Understanding the nuances of the product, thinking like the customer and being pro-active lead you to a path of excellence and growth. All the very best! And in case you are a bit lost, need a little bit of guidance on Test Plans, Test Cases, Automation scripts, do not hesitate to contact us. We provide On the Job support to help ease your transition.